Mascots have become an ingrained part of virtually every type of sporting event from all over the world. Some people love them, and some people (like Mike Wilbon) absolutely hate them. But no matter how you feel about a mascot's in game antics, it's hard to resist laughing at someone in an over sized costume that inadvertently creates genius physical comedy. Not the staged stuff that mascots usually do to entertain the fans, but honest to goodness accidents that are funnier than any PR rep or stunt coordinator could hope to dream up. 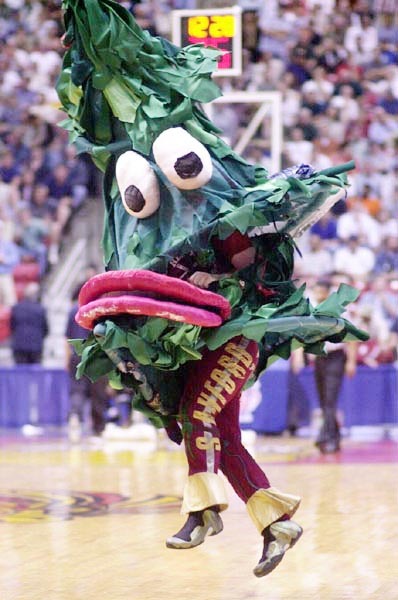 The following is my personal top 10 list of the greatest moments in sports mascot failure. During a 2010 exhibition baseball game between the University of Nevada and the Minor League AAA Reno Aces, the mascots of the respective teams decided to have a dance party on top of the Reno dugout between innings. As the wacky pair's dancing reached a fever pitch, Nevada's mascot, Wolfie, attempted the difficult transition from doing the "windmill" to moonwalking...without realizing where his impromptu dance floor ended. (Video has no sound, but it's not needed). What you may have missed while laughing: The Reno Aces mascot, Archie (who looks like a drop of jelly that fell from a PB&J) frantically attempts to warn and then save his fuzzy friend before he plunges over the edge. Gives rides and crashes into things. At the 2009 Women's Track and Field Championships in Berlin, Germany, Jamaica's Melaine Walker won the gold medal for the 400 meter hurdles. Why it is not staged: Melaine Walker may have been euphoric about her victory, but I doubt that she would purposely celebrate in a way that could have given her a concussion. What you may have missed while laughing: The announcers stopped watching Melaine and Berlino's antics to interview the distraught 2nd place finisher, Lashinda Demus. Right at the moment when the announcers switched into their "sober defeat" voice setting is when Berlino collided with the truck. We are all well aware that mascot fights are almost always staged. This one, however, was not. In 2010, the Ohio State Buckeyes played Ohio University at home. During Ohio State's pregame ceremony, Brutus, the Buckeye's mascot, did his usual run out with the cheerleaders. That's when Rufus, Ohio University's mascot, decided it was time to throw down. Here's another angle of the fight. While not nearly as close to the action, you get to see Rufus' entire take down of Brutus in the endzone. Why it is not staged: Ohio University issued a formal apology to Ohio State and banned Brandon Hanning (the student wearing the Rufus costume) from being affiliated with any other Ohio University athletic functions. Hanning didn't really care since he had been planning his game day assault on Brutus for an entire year. What you may have missed while laughing: The Ohio State players kneeling in solemn prayer/reflection as the fight continued in the end zone. Why the mascot for the Utah Jazz is a Bear...and why is name is simply just "Bear"...still baffles me. But he apparently provides some great entertainment for the fans during home games. While Bear may have a history of staging events to look real, this one was definitely an accident. The Utah Jazz were celebrating a long time season ticket holder's birthday by bringing him a birthday cake. The cake came complete with delicious icing, an inscribed birthday message, and lit birthday candles. The moment was made even more special due to the fact that Bear was the one delivering the cake. Why it is not staged: While it is no secret that NBA mascots have a proud tradition of staged cakings, I seriously doubt that a cake with lit candles was purposefully dropped from the upper deck onto the fans below. What you may have missed while laughing: Instead of getting angry or filing lawsuits over possible/fake burns, fans in the lower deck began to have a food fight. Boomer, the mascot for the Indiana Pacers, took his antics to a local high school game while the Pacers were on the road. What started out as the cliche "mascot uses trampoline to dunk" routine, however, became something much more awesome and destructive. Why it is not staged: Since the backboard could not immediately be replaced, the game had to be moved into an auxiliary gym. What you may have missed while laughing: In the first video, watch the bottom left hand corner of your screen. After the dunk, out of nowhere you'll see Gumby going crazy along with the rest of the student section. Boomer's response to the incident on his twitter: Ooooops. In December of 2010, the Cincinnati Bearcats were playing at home against Pittsburgh in very cold and snowy conditions. After a long run by Pittsburgh's Dion Lewis for a touchdown, the player was pelted with snowballs. The main instigator of the snowball throwing? The Bearcat. That's when the police stepped in for what might be the most ridiculous looking arrest ever recorded. Fair warning: There's a bit of audible foul language...and a policeman holding the mascot's head as if he just decapitated a puma. Why it is not staged: The person in the mascot suit was detained and cited by the police for disorderly conduct. What you may have missed while laughing: A girl in the background (who is most likely the girlfriend or a family member of the Bearcat) pleads with the camera operator to stop recording the incident because it's "not funny." During a 1992 football game between Northeast Louisiana University (represented by Chief Brave Spirit) and Northwestern State University (represented by Vic the Demon), a fight broke out in the end zone between the two mascots. This video has it all: Interviews with the actual costume wearers, excellent narration, and dramatic music. Why it is not staged: As if you couldn't tell from the actual fight or the participant's interviews, this fight got very real very quickly; police had to be brought in to break it up. Chief Brave Spirit also broke one of the cardinal rules of mascot fisticuffs: You don't remove another mascot's head. 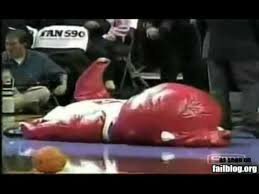 What you may have missed while laughing: The incredibly disturbing sight of a mascot (with his over sized head torn off) throwing punches into a walking racial stereotype. 4 (B). Auburn's War Eagle needs flying lessons. This one's eligibility is questionable since it involves a live animal instead of a costumed mascot, but it's too good to be excluded from this list. Before every home football game at Auburn University, an American bald eagle named Spirit flies around the stadium while the crowd cheers him on. While this is usually a breathtaking sight to behold, things didn't go very smoothly for Spirit on September 10 of 2011. Why it is not staged: If Auburn really did somehow train and command an American bald eagle to smash head first into a stadium luxury box, than P.E.T.A would have been occupying Toomer's Corner before the sun went down. What you may have missed while laughing: The eagle reacted just like most of us do after an embarrassing physical mishap; he played it off like it was no big deal or was done on purpose, and then continued about his business. Why it is not staged: He jumped into a wall of flames wearing a very flammable costume. If this was staged, than it was a very elaborate and public suicide attempt. What you may have missed while laughing: The cheerleaders (yes, they have them for hockey as well) had to pull Wild Wing out of the fire as the underside of his costume was still burning. During a home basketball game in 2011, Vanderbilt's mascot, Mr. C, decided to have a little fun with the student section....and by fun we mean throwing a vicious haymaker into a student's face. Why it is not staged: That's real blood pouring out of that student's nose. What you may have missed while laughing: ESPN goes on to show an even better view of Wild Wing's descent into fire and a Moose mascot slamming into an outfield fence. Any of you that know me personally are well aware of my affection for the following video. It may be the greatest thing ever recorded in the history of mankind. It starts out with the Toronto Raptor's mascot attempting to go down the stairs in rollerskates. From there, things spiral downward into a world of pain and humiliation...and unbridled joy and laughter for all those observing this glorious event. Why it is not staged: I guess it could be, but I have a hard time believing that something so beautifully chaotic (and apparently painful) could and would happen on purpose. What you may have missed while laughing: Watch the Raptor's tail deflate after he faceplants and is laying on the floor. Well there you have it. Not exactly high brow material, but I'm probably not the only one that finds way more entertainment than I should when it comes to watching mascot accidents. If I missed anything, please feel free to leave it in the comments section. If there's enough interest and material, there could be a Part 2.
there has to be some stuff out there that I missed.